As successful companies and entrepreneurs continue to learn, it’s advantageous to be an early adopter when it comes to new technology. Your company looks like a leading expert in its industry, well-informed and up-to-date on the latest innovations. There’s an energy created when you test out new features at a corporate event that’s unmatched. So what’s rolling out these days that’s worth your time? What can you include in your next corporate event that will put your expertise (not to mention your on-point branding and messaging) on display? The answer may seem strange: augmented and virtual reality. 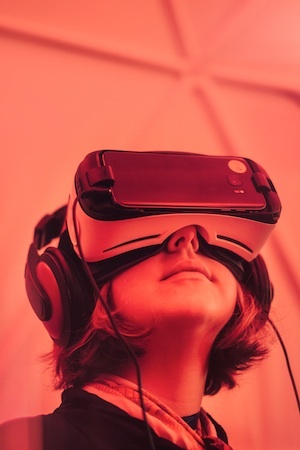 AR and VR technology has evolved into something rather impactful for companies looking to gain traction and build an audience. These altered realities may sound like something strictly for a video game, but that’s actually far from the case. Augmented reality means incorporating technological graphics and functions into real-life scenarios. This can be implemented in several different ways. Examples include: rolling out a sublimated carpet to show earthquake fault lines at a museum or an app that points out exactly where constellations are located in the sky in relation to your current perspective. Or, it could look like featuring a 360 degree photo booth with a green screen that’s customized to your branding and captures the essence of what makes your company great. It’s easy to see how energy can be quickly heightened with the addition of just a few new tools. Event management professionals are also starting to notice that as the importance of corporate events increases, so does the importance of the data collected during the event. Investment in data integration and audience engagement strategies is proving valuable. Select a fully connected meeting site that can accommodate tech accessories and provides a strong wifi signal. Use live-streaming social media platforms like Instagram and Facebook Live to reach both physical and virtual attendees on a new level. Try out VR headsets that promote your marketing campaign. Look into event apps, audience response systems and event registration management software that helps you learn audience preferences and ultimately allows you to anticipate consumer wants and needs. Take a few live pools to keep the interest level up and show your company’s tech-savvy side. Install a bullet time photo booth that delivers a comprehensive, 360 degree view of the moment, building the excitement you’re looking for while staying true to your brand. These 360 photo booths instantly send event images to your guests’ inboxes after the first click of the cameras. Then, attendees can easily share these epic moments to their social channels, promoting your company even more. Capture your next corporate event with a full perspective. AR/VR technology like 360 booths raise any corporate event, gala, launch party or trade show to a new level. At Pixperience, we offer tons of experiential marketing resources that will give your next event above-and-beyond ROI. Check out the Pixperience portfolio and discover what’s possible. Then, talk to us when you’re ready to discuss customizations.